A key challenge in executing a sensible hedging strategy is the inevitable second guessing that happens with the benefit of 20-20 hindsight. Whenever a hedge loses money, outsiders question how much more profitable the company could have been without the hedge. Comparisons are made against competitors that did not hedge, and so performed better. No matter that the hedge accomplishes its objective—reducing volatility. When that reduced volatility is windfall profits foregone, the carping begins. Airlines that do hedge, have had to report losses on their hedge positions. Delta’s 4th quarter announcement revealed more than $1 billion in charges due to mark-to-market adjustments on its fuel hedges. The losses on hedges offset some of the benefits the airlines are capturing from the drop in fuel prices. If they hadn’t hedged, shareholders would have seen a larger gain from the drop in fuel prices. That puts pressure on management to get rid of the hedging program. Southwest Airlines announced that it had eliminated its hedge on 2015 prices, so if the oil price drops any further, all of that will drop to its bottom line. It also reduced the scale of its hedging in 2016, 2017 and 2018. Does it make sense to eliminate the hedge? Is this a case of trend following—having missed the initial decline, the company hopes to catch the next decline? Is this a case of not standing by a well thought through strategy when short-term events fail to go your way? These are real problems in executing a hedging strategy. A case can be made for adjusting the hedge ratios in response to the fall in price. After all, as Southwest’s executives explained, the purpose of hedging is to provide “catastrophic protection”, meaning against sky high jet fuel prices. With prices as far down as they are, we’re far away from catastrophe. If prices start back up, and if the company is nimble, there will be time to insure against catastrophe. Classes at MIT started yesterday, and this semester I’m teaching Corporate Risk Management again. 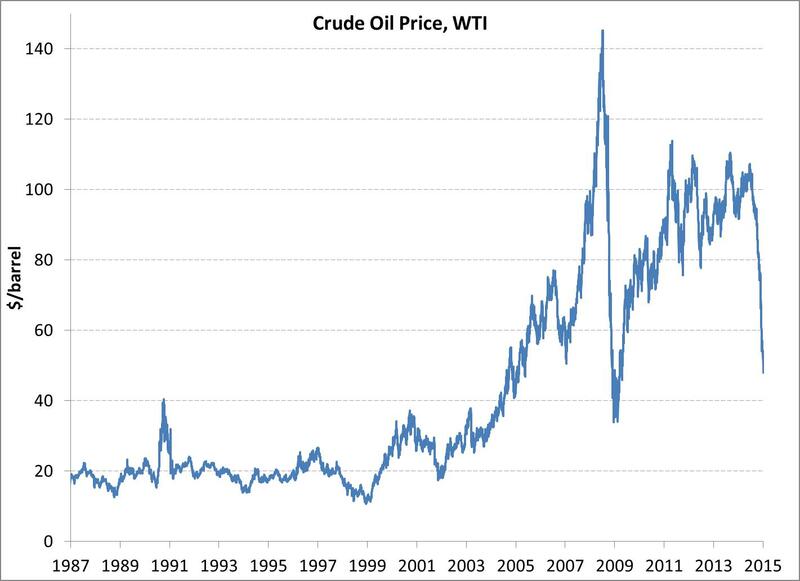 The dramatic plummet in the price of oil over the last few months provides an outstanding live case study of all of the critical issues. To really get a flavor for what a major event this is, it’s useful to look back at the price over a long window of time. Oil companies are facing a sharp cut in operating cash flows. How should they react? Should investments be cutback? One factor in making the decision is the forecast of prices going forward. Are prices at a temporary low, from which they will bounce back? If so, cutting back investment may be unwise, sacrificing future profits. Some companies may not have the luxury of deciding whether or not to cut investments. There may just not be enough cash. Of course, that’s where hedging could have helped, providing a cushion of cash flow to support ongoing investments through a tough patch like this. Companies have an amazingly diverse approach to hedging, and we can examine how different companies fare through these times. Of course while a price drop is bad for producers, it is good for consumers. Airlines have been posting record profits, helped in part by the drop in jet fuel prices. Fares have not dropped in line with fuel costs, so the fuel cost savings have dropped to the bottom line.